troppo and Oscar Building’s design for the ‘Hard Tent’ was showcased just now at the 2018 Grand Prix in Melbourne. The event last 4 days, and over that time Parks Victoria hosted a mini sustainability festival from within the park grounds, where policy makers, architects, furniture and industrial designers and chefs showed off their environmentally responsible creativity to eager GP patrons. troppo are excited to join skills with Oscar Building, a 3 generation old family-owned company based centrally to Australia’s highway system in Horsham, Victoria. Together, we’re proud to produce prefabricated architecture with no waste, using Australian labour and everywhere possible Australian materials and products. There are currently 8 different trop_pod designs. The Hard Tent, shown below, is fully customisable, as are the others in the range. This version includes a tea bench/bag park joinery unit and outdoor bathroom. All elements including the beautiful tap and sink are handmade by Oscar Building. Oh and who could go past that toilet roll holder! 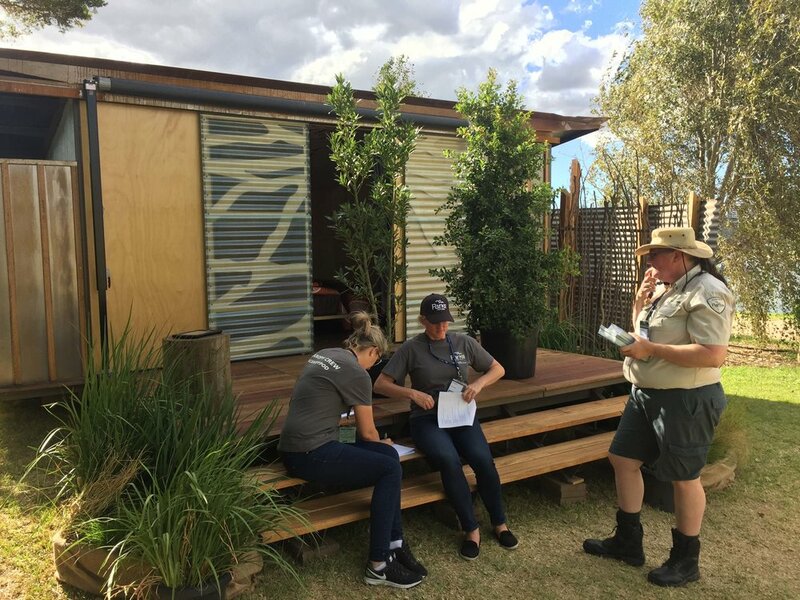 Parks Victoria's #Canopypod event the at Grand Prix was a pilot project to test prefabricated architecture as part of a wider strategy to promote ecotourism in the state’s parks. At the four days of the Grand Prix surveys of visitors were collected. These will now be taken to Government to translate into project funding, and a potential roll-out in campsites and on walking trails. Parks Victoria will next travel the Hard Tent to Point Nepean National Park for further community showcasing.